Braddock Road: Twelve Springs Camp, Pennsylvania. The Braddock Road, south-central Pennsylvania, March 20, 2010. The Braddock Road was a military road built in 1755 in what was then British America and is now the United States. It was the first improved road to cross the barrier of the ridge lines of the Appalachians. It was constructed by about 2,500 troops of the Virginia militia and British regulars commanded by General Edward Braddock (1695-1755), part of the expedition to conquer the Ohio Country from the French at the beginning of the French and Indian War (1756-63). George Washington, who was aide-de-camp to Braddock, had pioneered this route a year earlier when he traveled into the Ohio Country and met Native American leader, Tanacharison (1700-1754). The expedition gave Washington his first field military experience as well as other American military officers whose numbers profited from this military outing later during the American Revolutionary War (1775-1783). 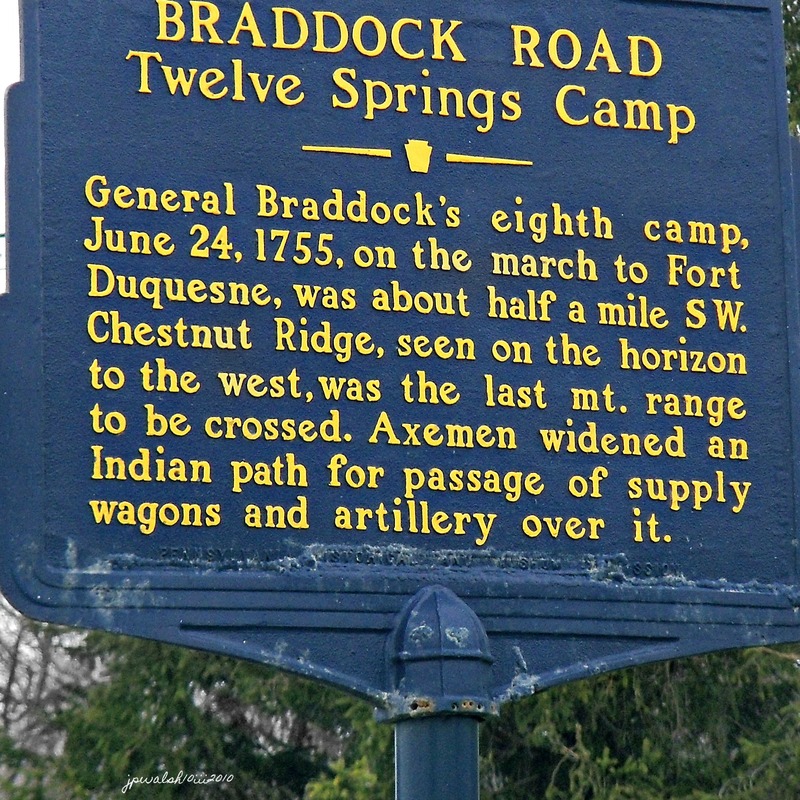 Braddock’s men had to cut a road wide enough to accommodate the wagons and draft animals that accompanied them, as well as the siege artillery that they brought along to use against the new Fort Duquesne established by the French in 1754 at the confluence of the Allegheny and Monongahela rivers. Progress was painstakingly slow until Braddock split the force into a lead column of about 1,500 men and the rest as a support column to drag artillery and supplies. The flying column made rapid progress, and with each day, the distance between it and the support column increased. This marker is on the (later) National Pike (Route 40) between Elk Park and Farmington, Pennsylvania. This entry was posted in American History., My Photography, Travel: USA, U.S. History and tagged Braddock Road, Fort Duquesne, French and Indian War, General Edward Braddock, George Washington, Tanacharison on July 12, 2018 by jwalsh2013.